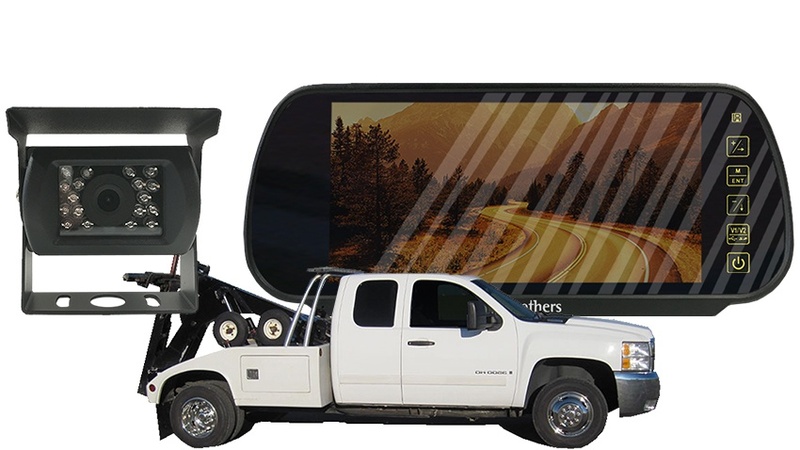 The durable 7 Inch LCD Mirror Monitor is a perfect addition to any wrecker auto loader that needs assistance viewing what’s on their bed or simply while backing up. See your rear view you in rich colors day or night. The included Mirror doubles as a regular mirror, when the camera is off, and a monitor (7” viewable) when the camera is on. Remember, even when the camera is on you can still use the parts of the mirror section that remain a mirror. In addition, it has two video inputs so you can connect a camera and a game system or DVD player. This mirror monitor is compatible with all our cameras and any car; it connects to any power source or a cigarette lighter. This is the perfect rearview system for a wrecker or auto loader because it has been designed specifically for it. Since we designed our first auto loader rearview system 5 years ago we have sold it to countless municipalities around the country and the world. The installation is very easy and once installed it is very reliable for example the mirror mounts simply by clamping on to your current mirror and the clamps are adjustable so it will fit all model of wrecker. The commercial wrecker rearview camera features a 120° Degree viewable angle, its heavy duty and 100% waterproof it has auto night vision. The camera is one of the most durable we have, with incredible adjustability and night vision clarity. This auto loader rearview camera has a metal sun shield visor to protect you from glare and pebbles. This is by far our toughest built camera. It has been regularly used in cars, vans, buses and even industrial sized caterpillar trucks, operated in the harsh oil sand of Canada. This camera can take a direct hit from a rock and it will still work like new. It has also been very popular with Box Trucks, because its housing allows you to install the cameras on multiple sides of your van. You can also upgrade this camera to be wireless and then you will not have to run any cables. Battery packs are available as well so you do not even need a power source.